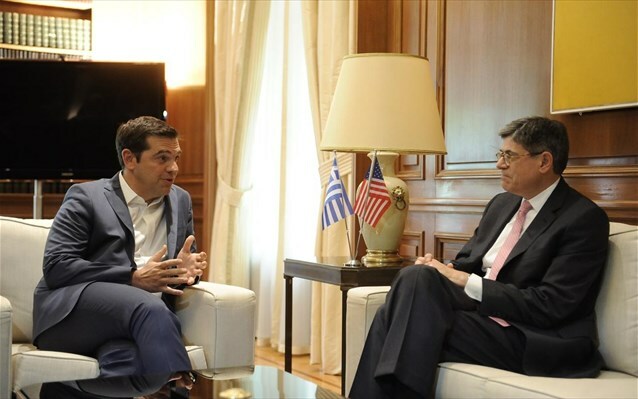 In their brief dialogue in front of the television cameras at the arrival of U.S. Secretary of Treasury at the Maximos Mansion , Jack Lew and Alexis Tsipras stressed the importance of Greece's role as a pillar of stability in the surrounding, fragile region. 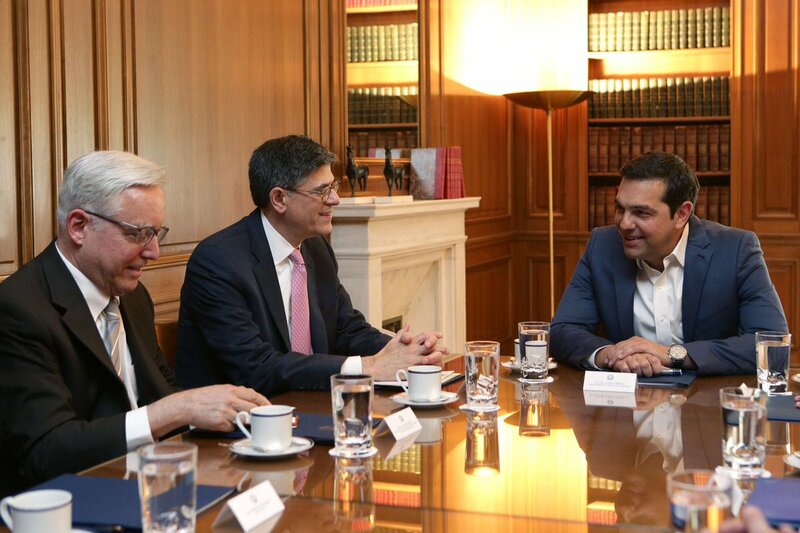 Under the current conditions, with developments in Turkey and the uncertainty caused by Brexit, the need for stability and growth in Greece was made even clearer, Lew was reported as saying. The United States intends to take a leading role on the issue of Greece's debt and aims for a deal to reduce the debt before the Obama administration has ended, U.S. Treasury Secretary Jack Lew told Prime Minister Alexis Tsipras during the meeting in Athens on Thursday, according to sources. 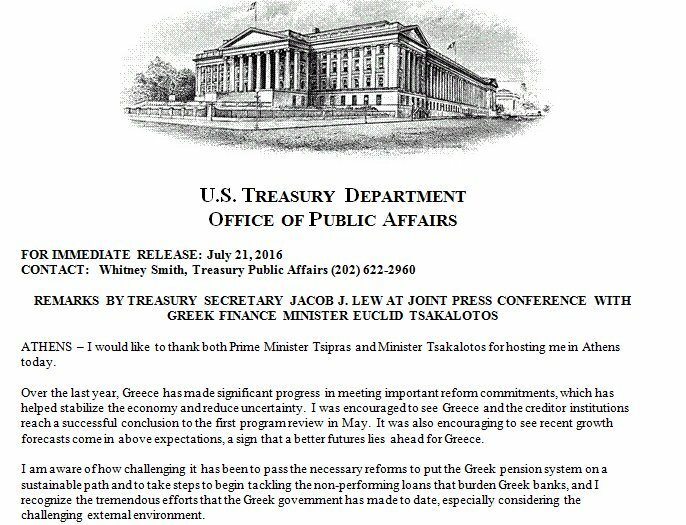 During the meeting, Jack Lew congratulated Tsipras on the extensive and difficult work done and the progress made over the last year, Greek government sources said, though noting that "more work needs to be done and it is important that Greece continues to implement the reforms and makes progress in areas such as privatisations." 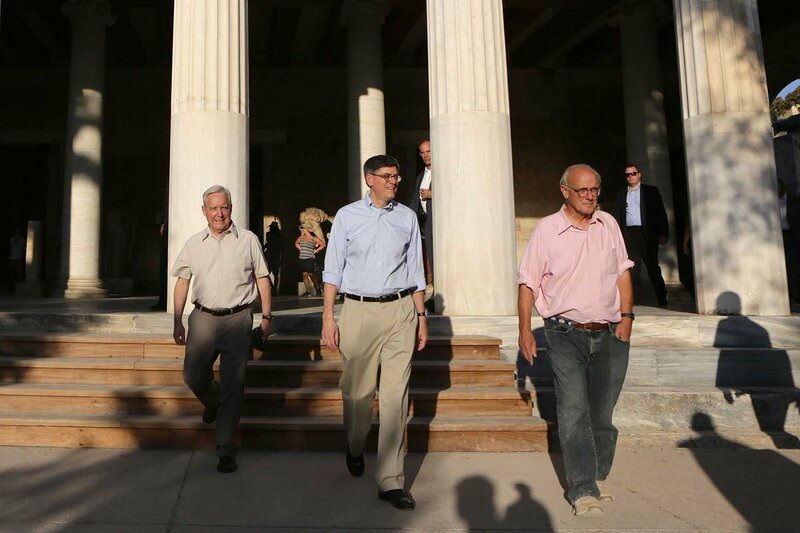 There is recognition and respect for the efforts of the Greek government and the Greek people to put the country and the economy onto a path of growth, Lew said, and the U.S. have for at least a year pointed out the great economic and geopolitical importance of Greece as a member of the European Union. Greek PM Tsipras highlighted durin tir talk Greece's geopolitical significance at a "troubled time for the region" and "a period of deep instability." "Now, more than ever, we need solidarity from our partners and now is the appropriate time to send the right messages to investors, to the markets, with substantial and solid measures to significantly relieve the debt, in order to support the economy and enhance Greece's role as a pillar of stability in a fragile surrounding region," he stressed. 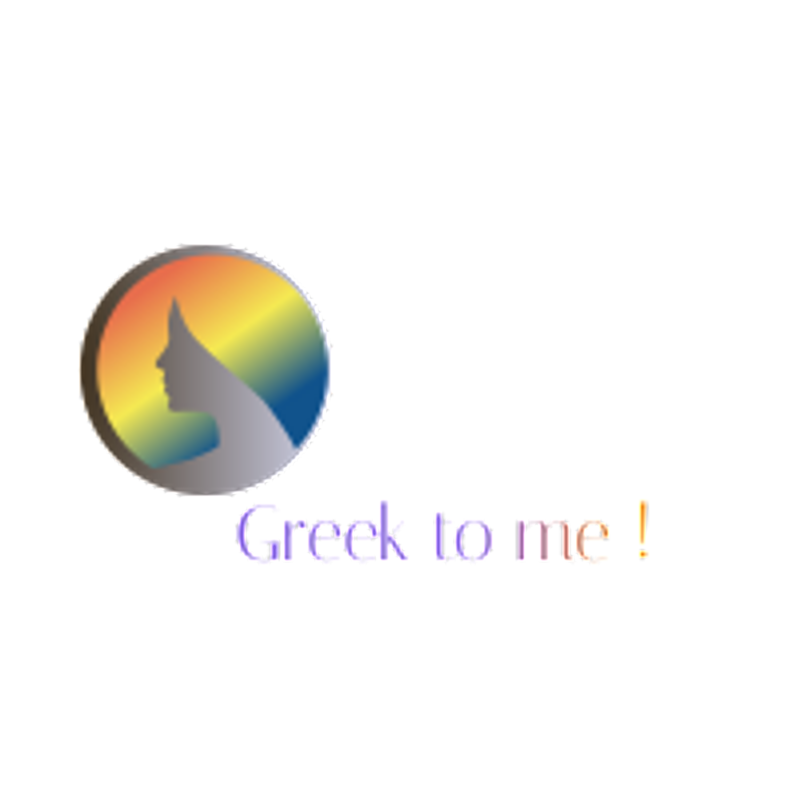 The discussion covered possible areas of cooperation between Greece and the United States, with emphasis on stamping out tax evasion and prosecuting cross-border tax cases. Athens raised the issue of cooperation on the UBS case and asked for the assistance of the U.S. Justice Department and the FBI in order to investigate cases linked to UBS and related to tax evasion cases in Greece, the ana mpa reported . Sec. Lew touring the Ancient Agora w/ U.S. 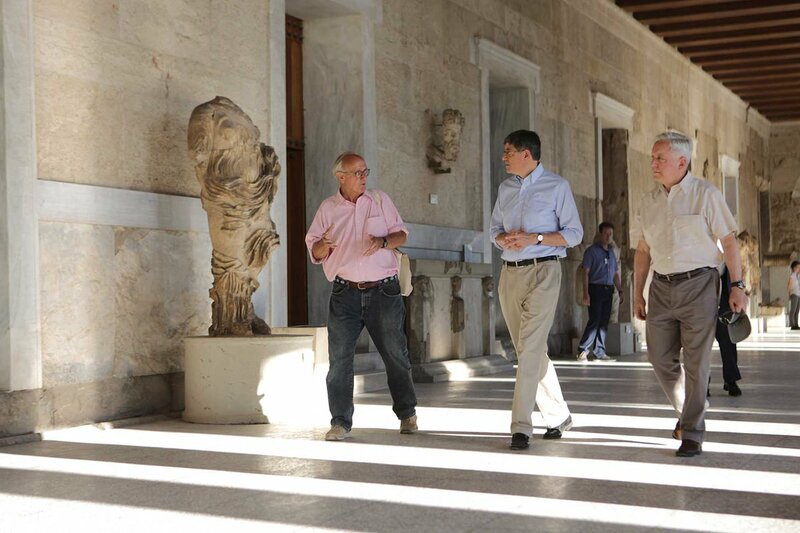 Ambassador to Greece @daviddpearce and a tour guide in Athens on July 20.